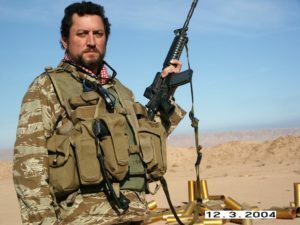 Lyle Hendrick enlisted in the US Army in 1974 with a specific objective of becoming a member of the elite Army Security Agency (ASA) Special Operations Detachment (SOD). Following MOS training he was assigned to tactical ASA company supporting the Third Armored Division in Europe until the end of his enlistment. Upon ETS he attended college and received two degrees and a Regular Army commission from ROTC, University of South Carolina. During his Officer Basic course, he was selected as the sole officer for direct assignment to the Special Forces. Following completion of Jump school and SFQC, he was assigned to 1/10 SFG (A), Bad Toelz and served as an ODA XO and staff officer. This was followed by the Officer Advance course and assignment to the 24th Infantry Division, where he separated from the Army at the rank of captain to pursue interests in the private sector. Lyle created his own private investigative business, which he operated for 15 years until accepting a position as a private security contractor in Iraq in 2004. Each step since then has led him to his current position as the project security manager on the largest infrastructure project currently in the United States. He remains active with the SF community as a member of the SFA, Chapter 34 in Columbia, SC and currently with Chapter 66, West Point. In addition to being appointed as an Ambassador with the Green Beret Foundation, Lyle is part of an effort to present the Frederick Award as an annual event to the US Military Academy for excellence in leadership.